Every Saturday, I host a feature called Kid Konnection -- a regular weekend feature about anything related to children's books. 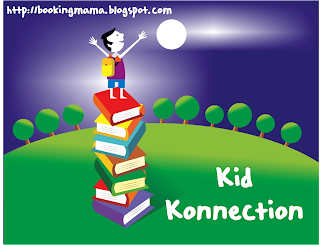 Today, I'm going to share with you some more fun Christmas books which Booking Son and I have been reading these past few weeks. THE TWELVE DAYS OF CHRISTMAS IN WASHINGTON, D.C. written by Candice Ransom and illustrated by Sarah Hollander was probably Booking Son's favorite out of all the Christmas books we read this year. I was a bit surprised since it's definitely longer than the other ones, but he's obsessed with The Twelve Days of Christmas song. So anything that ties in to that is a hit this year! This book takes the reader along with Olivia as she visits her relatives in Washington, D.C. Each day her aunt and cousin take her to a new tourist attraction where she learns something new about the area. After her daily excursions, she writes her parents a letter explaining what she discovered. I actually enjoyed this book a great deal too for a number of reasons. First, it was like a trip down memory lane for me. We lived in the D.C. metro area for over ten years and it was nice to reminisce about many of the fun landmarks and tourist spots. In addition, I really liked how educational this book was. Not only did my son learn a few things about Washington, D.C. and its history, but I discovered some new-to-me places to visit. Finally, I admit it was fun to sing along to The Twelve Days of Christmas with my son! THE TWELVE DAYS OF CHRISTMAS IN WASHINGTON, D.C. is one in a series of The Twelve Days of Christmas books. There are also ones for many other states including Virginia, California, and New York to name a few. I definitely recommend this series --the books are fun and educational! Summary: Christmas is coming-and where better to celebrate than in Busytown? Firefighters are stringing lights, stores are crowded, and everyone is in a merry mood. Richard Scarry captures holiday cheer in a series of delightful and brightly illustrated stories featuring his most popular characters, including Huckle Cat and lovable Lowly Worm. How can you go wrong with RICHARD SCARRY'S BEST CHRISTMAS BOOK EVER!? I grew up on Richard Scarry books and I still love all his adorable characters. I'm embarrassed to say this, but I think this might be the first Richard Scarry book that Booking Son has read. He must take after his mom because he absolutely loved it. The book is actually made up of quite a few short stories. I've found that we read a few a night because Booking Son likes to take his time looking at the illustrations. I enjoy reading them and remembering all of the characters (I love Lowly Worm! ), and as a mom, I like that there are a few with some heartwarming messages! LITTLE CRITTER'S THE NIGHT BEFORE CHRISTMAS by Mercer Mayer is another very sweet book. It's a re-telling of the classic story The Night Before Christmas by Clement Moore; however, it has adorable illustrations of Little Critter. Booking Son liked this book too and he immediately recognized the story. His sister dances in a show which creatively interprets the story and he enjoyed telling me which dances fit in to which parts of the story. I found that I enjoyed this version of the story because the illustrations were so humorous. I just love Little Critter! Summary: Let the holiday magic begin! Stockings hung by the chimney with care. Visions of sugarplums dancing. And that jolly old elf, St. Nick, with his eight tiny reindeer. That can mean only one thing: it's The Night Before Christmas! From popular children's illustrator Robert Ingpen comes a beautiful new interpretation of the classic holiday poem. Ingpen's stunning pictures capture all the warmth, wonder, and humor of Clement C. Moore's beloved verse. 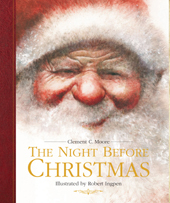 THE NIGHT BEFORE CHRISTMAS illustrated by Robert Ingpen is just gorgeous. We actually read this book the night after LITTLE CRITTER'S THE NIGHT BEFORE CHRISTMAS, so the story was very fresh for Booking Son. He actually noticed that a few of the words were different in each of the books and took pleasure in pointing that out to me. What really made THE NIGHT BEFORE CHRISTMAS stand apart from other holiday books was the illustrations. There are only a few verses on each page, so there are plenty of pages filled with pictures from the story. The illustrations are positively beautiful and so detailed; and I found them to be a perfect complement to the story. And last but not least is THE TOYMAKER'S CHRISTMAS: PAPER TOYS YOU CAN MAKE FOR YOURSELF by Marilyn Scott-Waters. This isn't your traditional holiday book. Rather, it's a book that contains paper cutouts that you can assemble. Included in THE TOYMAKER'S CHRISTMAS are eleven different paper toys as well as the "Toymaker's" instructions for putting them together. Kids will love assembling all of them, but I especially liked the angel, the snowman, and Santa's sleigh. THE TOYMAKER'S CHRISTMAS is guaranteed to keep kids (and parents alike) entertained for hours! Thanks to the publisher for sending me these great Christmas books. Any (or all) of these books would make great holiday gifts! What a good selection! I'd love to see what's in the D.C. book! And I love Mercer Mayer - he is definitely one of my favorite illustrators! Those all look good! Vance loved any book by Richard Scarry, so he probably had that book. I love the cover of The Night Before Christmas it's just beautiful. I love a good Santa face. I hadn't heard of that Little Critter book - it looks cute. We all love the Little Critter in our house! You reviewed two of the authors we really love; Richard Scarry and Mercer Meyer. My son has been into Richard Scarry since we moved out of board books. Just this week we watched Richard Scarry's gingerbread man on you tube. Thanks for hosting. The Night Before Christmas book has such a beautiful cover, and the Little Critter one looks adorable! Darn! I wish I'd known about the Washington DC book! I think my boys would love it! I love Richard Scarry too. My husband loved little critter books when he was a kid so I'll have to find both of those for our boys. Great reviews.